In July 2016, the Government of BC imposed a steep property transfer tax on foreign buyers of real estate in Greater Vancouver. With the Government of Ontario actively looking at implementing a foreign buyer’s tax, now seems like an appropriate time to take a look at exactly what has happened in the Greater Vancouver Area in the 8 months since the tax went into effect(s) and what effect a similar tax might have in Ontario. 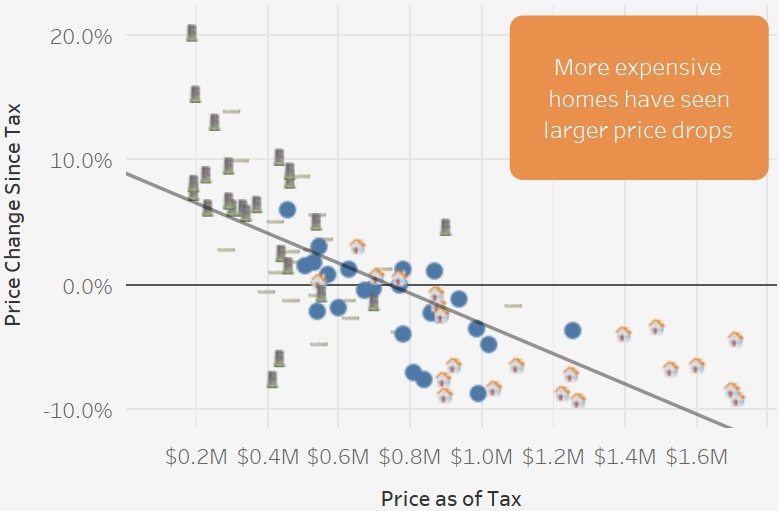 If you are interested in examining long-term prices trends by area and housing type across the Lower Mainland, check out our new interactive dashboard here. What are the possible implications for Toronto and the rest of Ontario? Want more info on housing prices in the Lower Mainland? Check out another one of our interactive dashboards here. The tax was large enough to push foreign buyers out of the market. However, the resulting uncertainty led many would-be local buyers to delay their purchase as well, causing a big drop in the number of sales. The foreign buyers tax was only implemented in Greater Vancouver (which goes from West Vancouver to Maple Ridge and does not include Abbotsford or Mission). Many local buyers, who were unsure of the impact that this would have, decided to delay their purchase. Most sellers, it seems, were content to wait it out, rather than accept a lower price point. The result was a precipitous fall in sales and a minor decline in prices, with the effect varying by type of household. We only have data starting from June 2016 (two months before the tax was implemented and one month before it was announced. The announcement in the month of July meant that a number of transactions that would have occurred in August were completed in July to avoid the tax, making the drop in sales appear more dramatic. So what does this mean for Toronto and Ontario as a whole? We anticipate a more muted response compared to Vancouver but you should still expect a decline in the number of sales and a much smaller, if any, decline in prices that will vary by region and housing type. Why Do We Think the Impact Will be Less in Ontario? The Toronto market is a lot larger and more inter-connected with other nearby housing markets than Vancouver. Housing prices are surging in Waterloo, Hamilton, Toronto, and the 905. These markets act as partial substitutes for one another, with some would-be Toronto buyers being pushed to nearby markets. This means that if Toronto has a higher concentration of foreign buyers and sees a decline in prices from a hypothetical tax, then some demand would come back from the periphery markets, mitigating the impact. In addition, stories abound of packed open houses and bidding wars. This is local demand, not foreign. A smaller percentage of foreign investment would mean a smaller impact. Will Ontario Impose a Foreign Buyer’s Tax? We’re betting they will, yes. The impact to residents will likely be minimal and there is broad-based voter support for it. This makes for a perfect policy recipe, given that elections with a particularly unpopular incumbent are on the horizon. Let us know if you think we are missing something or mis-characterizing the data in the comments below. If you would like to receive regular housing market updates, including monthly data on housing prices in your region, just sign up below.